Today's giveaway is brought to you by Melissa, of Windows By Melissa on etsy. 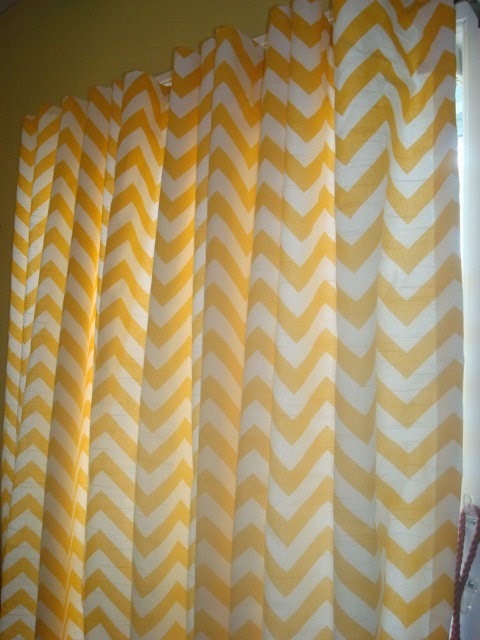 You can win a set of two lined yellow and white chevron stripe curtains which measure 50" x 84"
Please leave a comment on this post for each one. 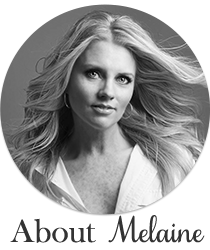 1~visit Melissa on Facebook, and "like" her page. She has wonderful giveaways on there as well, so be sure to check it often! 2~visit her etsy shop and tell me what else you see that you like! That is it! I will pick a random winner on Friday! Just liked her facebook page. All the items in her etsy shop are super cute, but I really love the greek key roman shades! Oooh great giveaway! I like Melissa on facebook! Melissa's roman shades are great and her prices are so reasonable! Hi there. I dont have facebook but did check out the etsy site.. Love the yellow pictures in the blog post. Thanks for the chance! Love the ribboned roman shade! Just liked her facebook page and I loveeeeee the Bella Porte Citrine fabric from Dwell Studio, and the chevron pillows I wish she had them in the raspberry pink like the ones on facebook they are georgeous. Thank you for giving me the change to win this beautiful drapes that will look great on my newborn nursery room. What a fab giveaway and gorgeous chevron curtains! I like her on FB! also love the Grecian key roman shade-would be gorgeous in a bathroom! From her shop I also like the grey chevron pillows and the banded roman shade and the relaxed roman shade lol. Too hard to pick just one. Love love LOVE these curtains! The pillows yellow/greenish ones in Melissa's etsy shop were my fave but i really like the roman curtains as well. Everything looks very tailored and beautiful. We just put an offer in on a new house and if it goes through I will have an office to myself for the first time in a LONG time! Those curtains would be SO FUN! I liked her Facebook page! Liked her page on FB. And I am pretty sure I need one of her roman shades in my kitchen! And love the roman shades on the etsy site! Hope I win so I can get these!! love the Dwell studio citrine fabric pillows! Just "liked" Melissa on Facebook. Just visited her wonderful shop. I love her chevron fabric pillows. I like Melissa on FB. Loved the roman shades! Really it's all fantastic! The Ribbon Roman shades are awesome! Actually all the Roman shades are. Love it! 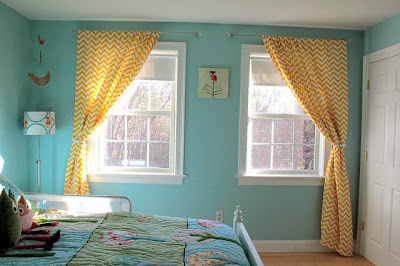 Love the chevron...curtains and pillows... And the shades are beautifully too! Love all the chevron and the roman shades too! I def liked Melissa on Facebook!!! I like the TWO 20" x 20" envelope closure pillow covers in Dwell Studio Bella Porte Citrine. They are gorgeous!!! I liked Windows by Melissa on Facebook. These would look so cute in my daughter's room. Thanks for the opportunity! i liked her on facebook! i loved her roman shades and those blue hidden tab panels too! Love love love these window treatments!!! I am so obsessing with chevron these days too...the greek key roman shades would look fab in my sitting room....not a bad price either!! I love her Roman shades, especially the Ribbon Design! I showed her facebook page some "LOVE"!! Just checked out the etsy shop--love the chevron pillows. Gorgeous...I liked her facebook page! I liked Windows by Melissa on Facebook!! I love the roman shades and the blue chevron pillows!!! Love the village blue and natural chevron pillow covers! Just visited and 'liked' her fb page. These curtains are fabulous. I love the roman shades! 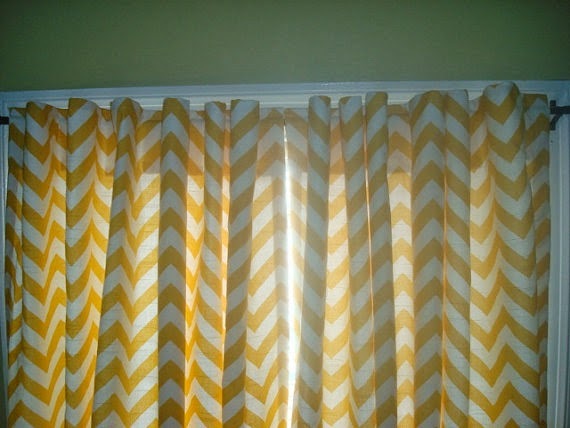 I like the Roman shades too but would love these chevron curtains for my room! I love the blue chevron pillows! I am also lovin' the chevron print throw pillows! The relaxed roman shades in the blue and white chevron print are really cute!! I also liked her page on facebook. Thanks! I "like" Melissa's Facebook page. I just checked out her Etsy site and love the light blue and natural chevron print shade. It would match my living room perfectly! She has great stuff! Liked the Chevron pillow covers. Wow! Only $14 for her 2 18"-square chocolate/natural pillow covers! I'd buy them if I wasn't already a sewer and had 3 similar pillows in my home. Her etsy shop has reasonable prices! Just liked her facebook page. I love it when blogs host etsy giveaways because I love finding new shops to support! Her flat roman shades are sooo pretty! I've been thinking about putting roman shades in my nursery too! I just liked her facebook page! Also checked out her etsy shop, I love the classic roman shade! I LOVE these curtains! They are exactly what I was looking for. I have to get some for my daughter's first birthday on Feb 24th.